1 - 3	 $35.16 ea. 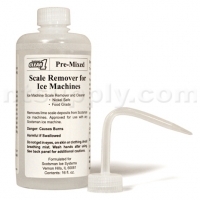 Ready Mix Ready To Use Scale Remover and Cleaner in convenient 16oz spout bottle. Can be refilled with Scotsman Clear1 Scale Remover / Cleaner 19-0653-01 diluted to the proper concentration level. Designed specifically for the Scotsman undercounter nugget machines SCN60 and NU130.